May 19, 2006 Morning of the hike in. Upon waking up, Bob had a few more items to give us. Things that had been in the cooler that we were going to use early in the hike. Cheese, lettuce, etc. Also, fresh fruit. We could take as much as we wanted, we just had to cart out the remains. He had apples and oranges. I took a few oranges, but not any apples. I didn't figure I needed the extra fiber. Also, Song's supplies that he had been responsible for had to be split up amongst everyone else. I ended up with a jar of peanut butter. Nothing too massive. We left the campsite at 5:20. Song didn't come with us. He stayed at the campsite as we drove away. Bob pointed the van east on highway 64 and we drove for a while. As we were going down a straight stretch, he slowed the van down and we noticed a small trail heading off into the woods. He turned the van around and pulled off to the side of the road. We unloaded all of the packs and he hopped back in the van and drove it off to a place where he could park. There wasn't any parking where we were at. So, he took it off a ways and planned to hike back to the trailhead. We took a photo of the group while we were waiting. Nick and myself both took a couple of bagels from breakfast and attached them to the back of our backpacks. Nick showed some people how to stretch the shin area before the exercise. I got out the description of the trail that I had printed out online and we had a little group reading session where I read the trail details to everyone. Each milestone that we hit before the hike gets me slightly more nervous. I can't wait for the feeling of going down below the rim for the first time. A couple of other cars passed. One Toyota pickup actually turned around right there and the guys in it stared at us as we were waiting for Bob. Bob arrived back and we got our packs on, got them tightened up, and started walking through the trees. After a quarter mile or so, we got to a sign that said "backcountry permit required to sleep beyond this point, etc etc". The rim of the Canyon was just beyond that. Bob wanted to get a picture there. As we were setting up for a pic, another guy showed up. He had seen us waiting, and wanted to wish us well. He said that he had been at the bottom of the trail 2.5 days earlier and had then hiked up some other trail. He also mentioned a spot part of the way down that had water pools 2 or 3 feet deep. He said that they were 100 or so yards off the wash at the beginning of the red canyon. Since that is "off trail", we didn't bother even looking. We were prepared well enough without needing that. Also, the guy hadn't been on New Hance trail. He wouldn't have known if water was there or not. I carried 6 quarts of liquid down. 2 quarts of Gatorade, a Nalgene quart of water, and the camelbak bladder held 3 quarts of water. Bob headed out down the switchbacks. The traveling order made itself clear somewhat quickly. Bob, with Lucky a bit or a ways behind, me and Nick, and David, Rachael, and Fabio. I think that it took Fabio a while to get used to walking down the trails covered with the scree and small rocks. The tennis shoes made it interesting, I'm sure. Bob stopped for the first rest break/catch up point where the first layer of rock turned into the second layer. Then we were off again. We came down the switchbacks pretty quick and dropped into a valley right next to Coronado Butte. We walked alongside Coronado Butte for a while and had our next rest break in the valley next to that. Somewhere along in here we had the sun hit us for the first time. Up until that point we had been in the shade. We rested in the valley. I ate the bagel that I had attached to the back of my backpack. It had already dried out. When I tore it apart it was just on the verge of leaving crumbs everywhere. Definitely not a wet environment. From there we headed out again. Bob had stopped at one point where there was a nice view, and Lucky had walked by him without seeing him. So, the rest of us walked on for a ways and found another place to stop and wait. Noticed a couple of hikers in white that were coming up behind us. Got moving again, and stopped for a rest stop at one of the USGS markers. It was marked 4955, but the map called it 4949. It corresponds to the elevation, so that's about how far down we had made it. The hikers in white were day hikers. They caught up to us and had a German/Dutch accent. We were getting ready to go down a steeper section, so everyone in our group joined up there. The sun was starting to beat down and the shade was feeling quite good. From there we headed down the switchbacks. We got to the end of that section, and we could see the day hikers down ahead of us a little ways. They were starting to head back up. They had actually made it quite a ways down into the Canyon before turning around. After meeting up again below the steep part, things leveled out for a while. Then, we had a hill that we had to go down that was in the red rock area and covered with pea gravel. The trail that we took went pretty well straight down the hill, and we essentially skied down the side of the hill. It was pretty steep, and the action required to keep from falling was really tiring. The sun was out with a vengeance, and after we finished that hill we had quite a long ways left to walk. It just wasn't much fun. I was really getting quite tired, and this was, without a doubt, the toughest leg of the entire hike for me. Finally, I came around the corner of a hill and saw Bob's backpack hidden behind the edge of a large rock that was 10-15 feet high. Lucky and Nick were a bit ahead of me, and I ambled into the shady area, took the backpack off, grabbed some water, and laid down. This was at about 3,400 feet. After laying there for 5 or 10 minutes, I started getting my strength back. Took off my shoes and socks to let my feet breath for a bit. Noticed that I had some spots that were warming on the outside of my big toes and taped them up with slick tape. I wanted to avoid a blister at all costs. This was our designated lunch spot (more likely, it happened to be where we were at at lunch time). After about an hour, the other 3 rolled in. When they got to the rock, Dave said that Rachael had collapsed earlier on the trail. Fabio literally fell asleep in the shade. They were tired (as we were). Once they arrived (with the lunch food, as it happened) we ate lunch. I had part of a muffin and 2 turkey/cheese/bagel sandwiches. I put some fruit bites in my short pockets so that I could eat them on the afternoon hike. I asked Bob when we were heading out, and he said we were leaving out at 2pm. (It was 1:45 when I asked) As 2pm was nearing, a guy came down the trail. Said he was with another guy (who was farther back relieving himself). He was from Las Vegas. They were going down New Hance, west along the river, and up the Grandview trail. He had brought down 6 quarts of water, and had drunk most of it. There was supposedly a spring part of the way up Grandview that he was going to get more water from on the way back up. Bob said that we were about 3 miles from the bottom, and there was a cloud overhead at the time, so we headed out and gave him/them the rock for shade. This rock was right next to a creek bed, and we started heading down along the creek bed. We walked and walked. I heard the wind down below, but the sun had come out from behind the clouds and it was definitely heating up. I started thinking about how far we must have come, and looked at the rocks up ahead, and a thought struck me, "That's not the wind.. That's the river!". This made perfect sense. I knew that I had to be getting close, and the way the rocks looked, the river just had to be in front of the large rock face I was seeing. Sure enough, I came around the corner and saw the dark green water of the Colorado River. Life... was good. The time was about 3pm. I didn't end up eating of the snack food out of my pack. The problem with that is that it doesn't reduce the weight that I have to carry if I don't eat. At the time, the basic order was Bob, Nick, and me. 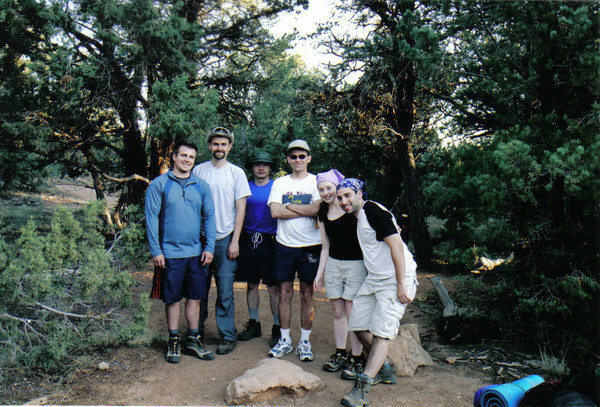 Fabio, Lucky, Dave, and Rachael were still coming down on the trail. Bob had me get out the water purifier and I learned how to use it. Bob had the small aluminum pot, and we filled the pot up with water from the river. Then, the hose end of the filter went into the pot full of water and a few pumps of the T-shaft on the filter had a stream of water flowing. We got one of the 2-quart plastic jugs and filled it up with water first, and Bob took the cold water and headed back up the trail to meet Dave and Rachael. The water in the river is about 45°. It's quite cold. After standing in it for a while your feet really start to hurt. It feels really good after the sun, though. Once Bob, Dave, and Rachael arrived, Bob took some of the water that we had filtered and put it in the gallon ziploc bags of dehydrated beef, beans, and salsa to let them start hydrating for supper. (Bob had previously dehydrated a lot of food himself to save money) Water filtering continued. We had many a quart to refill after the trip down. I had gone through about a gallon of liquid. That morning had been a model of what I ended up doing most every day of the hike. Start out with a quart of Gatorade, and follow that up with water. I had read once that most people wait way too long to start drinking Gatorade. By the time they think they need it, they really should already have it in their system replenishing things. So, they say that you should drink the stuff a couple of hours before you plan on really working up a sweat. At any rate, we had a lot of bottles to refill. We had basically deposited our packs in the creekbed at the bottom of Red Canyon. For actually setting up camp, we moved everything upstream a couple hundred feet. I took some pictures of some rafters and generally took it easy. Supper was Tex-Mex. It was very good. Beef, refried beans, tortilla shells, lettuce, cheese, salsa, and Koolaid. (We had Koolaid with supper each night. It makes for a nice change from drinking water, water, water). I think that this is probably a typical first-night meal "spread". The lettuce, cheese (and, to a lesser extent, the soft tortilla shells) aren't the type of food that would keep their positive vibe after a few days of hiking. But, it was quite tasty. We ate until we were full. Whoever brought down the food for a given day was responsible for getting all of the trash out for that meal. So, if a meal came down in 4 ziplock bags, whoever brought it down had to cart the trash out. BUT, if all of the food wasn't eaten for a given meal, that person was responsible for hauling all of the uneaten food out as well. You can't leave uneaten food in the Canyon. Animals get the wrong idea. So, everyone made a pact early on that we would go to great lengths to eat all of the food that had been brought in. It's one thing to haul dry food into the Canyon. It's another entirely to have to haul rehydrated food back up a vertical mile. So, we ate everything. Then, in a surprise twist that was to become a nightly event, Bob presented everyone with dessert. For the first night it was a somewhat squished Fudge Round. The taste was still there, though. Once the meal was eaten, the pots still had to be cleaned. The two pots (Lucky had brought the big pot down; Bob the small) were scraped as clean as possible with the dinner spoons, and then they are cleaned with sand and water (No soap in the Canyon). This wasn't too bad. Just had to spend some time in the river working with the sand. A different person got cleaning duty each night. Frankly, I don't recall who had the pleasure of doing it the first night. We also purified 6 quarts of water to use for breakfast. For the campsite, we had a nice sized sand bar that was near the river, but there was a row of trees in between the sand and the river. There were two "open spots" in the trees leading to the river. Bob set up camp right on the river's edge near one of the openings, and Lucky and Fabio managed to work themselves into the other opening. The rest of us set up on the nice sandy area a few feet farther from the river. This worked out pretty well. The wind picked up in the evening and the blowing sand was a bit annoying, but the wind died down after sunset and it wasn't too bad. I took a few pictures around golden hour. Then sun doesn't get down into the inner canyon very well after a certain time of night. So, the pretty color didn't really get down that far. But, I got a few neat shots. I hadn't really known how well it would work out anyway. We had some guys walk through camp a bit before we went to bed. They were headed west along Escalante Route (where we were going to head East the next morning). It was warm overnight. I started sleeping without the sleeping bag, but got into it later in the night and I sweated a few times here and there. I managed to wake up a few times. It was interesting watching the rocks change colors as we descended into the Canyon. Both colors and style. We went through shale, sandstone, limestone, granite, and even a few sections of lava flow. Quite interesting. Be sure to check out the picture links above. Many of these pictures would make beautiful photo coasters that can be given away on Grandparents Day. Snapfish and Shutterfly coupons are very handy when ordering photo gifts. Shutterfly directions.